XII, 411 p., 15,7 x 21,5 cm. The editors of the 42-volumed critical edition of Johann Gottlieb Fichte’s works have accumulated extensive materials during their years of research, e.g. letters from Fichte’s contemporaries commenting on his work, as well as diaries, memoirs and journals. 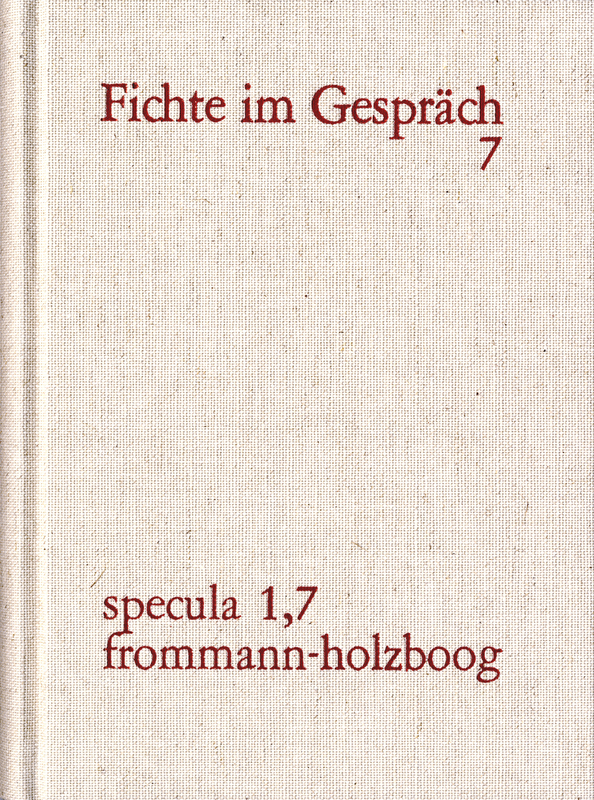 These materials (over 2.500 original statements by Fichte’s family members, friends, colleagues, critics and pupils) make up the first 6 volumes of ›Fichte im Gespräch‹ which were published during 1978 and 1992. – This new supplement volume contains additional documents that have been accumulated during the past 20 years. The authors include Fichte’s son Immanuel Hermann, Heinrich Heine, Immermann, Eichendorff, Schleiermacher, Varnhagen von Ense, Rahel Levin and Salomon Maimon. Alongside the previous volumes, volume 7 not only marks a new and important contribution to research on Fichte from a biographical angle but it is also highly relevant to the history of philosophy during Fichte’s times in general.